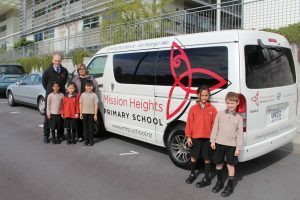 Mission Heights Primary is a Gold Travel Wise school and our focus is sustainable and safe transport for our students and families. 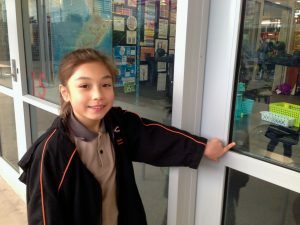 We will be looking for ways to further reduce our carbon footprint by encouraging students to walk to school. Our big focus this year will be reminding our community that wearing seat belts is critical to safety and getting the message out there that texting while driving is a big no-no. 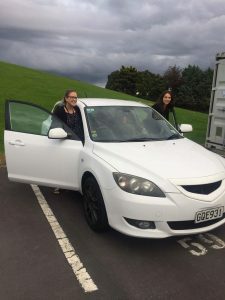 Meet the Travel Wise Team 2019! 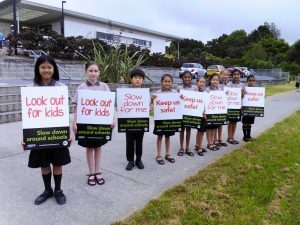 Here we are reminding our community that we are back at school and that they need to be mindful about sharing the road with us. 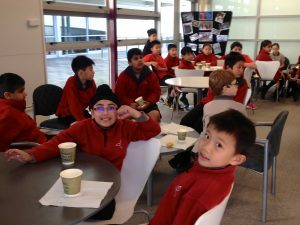 A team of eight students attended the annual celebration at The Cloud. 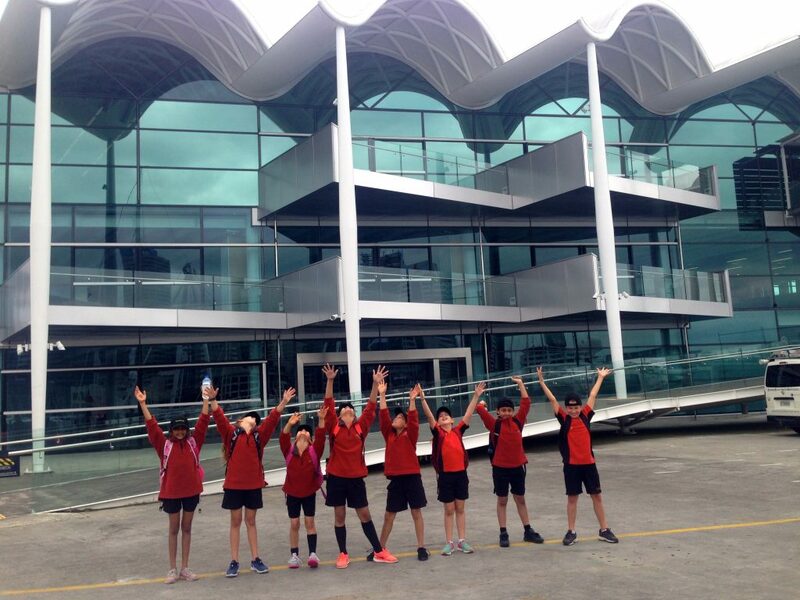 The objective was to make us aware of the various transport experiences that we can enjoy in our City of Sails. 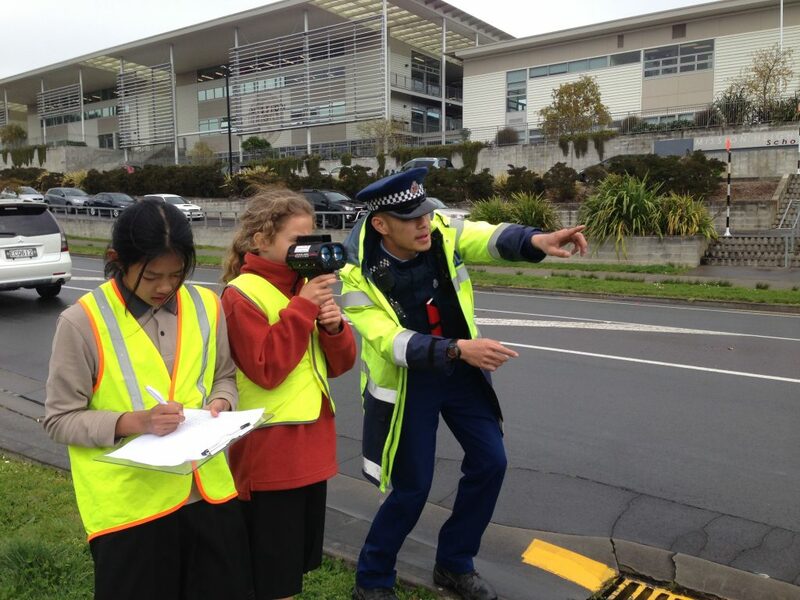 We learned a lot from our Speed Camera initiative. We recorded speeds as high as 64kph. 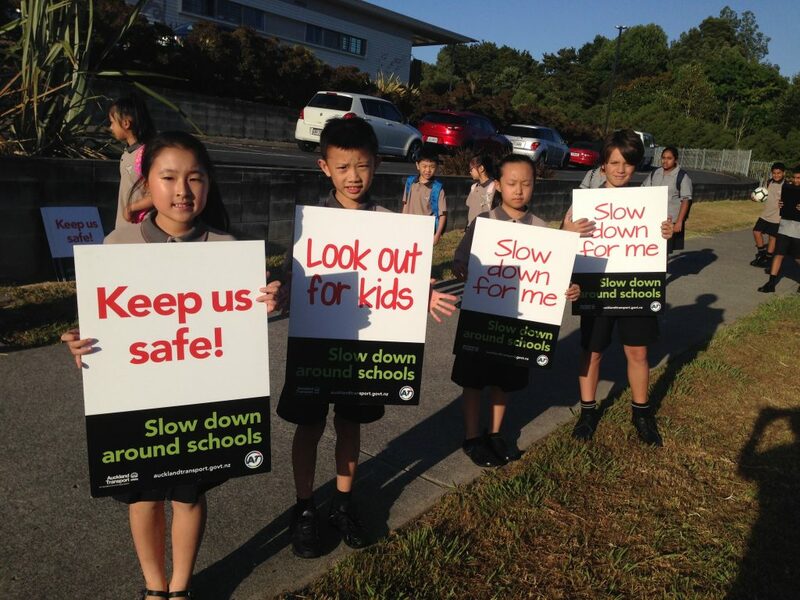 We reminded drivers of the dangers of speeding around schools and thanked those who drove within safe speed limits. 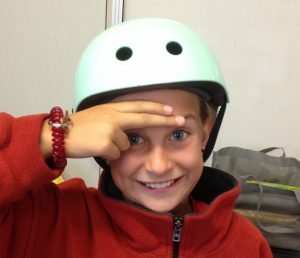 Helmet safety: putting the skills we learned as Bike Ambassadors to use. 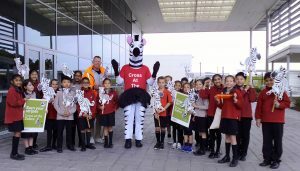 We so enjoyed having Zara the Zebra with us one afternoon. 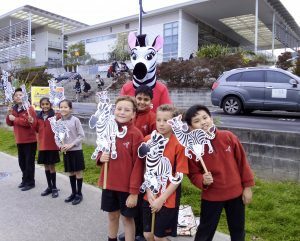 We highlighted the importance of crossing at the zebra crossing on Jeffs Road by walking across with our zebra cutouts. 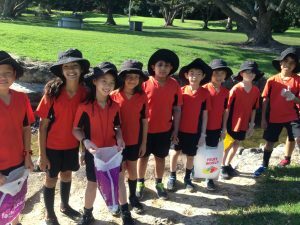 We rewarded our Walking School Bus with a winter treat of Milo and lamingtons. The theme was Be Bright Be Seen. 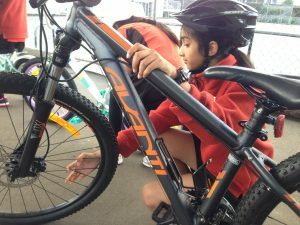 A team of students enjoyed the Bike Ambassadors initiative. 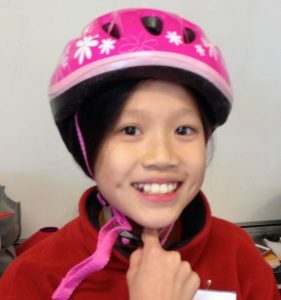 They learned about helmet safety, bike maintenance and riding safely. 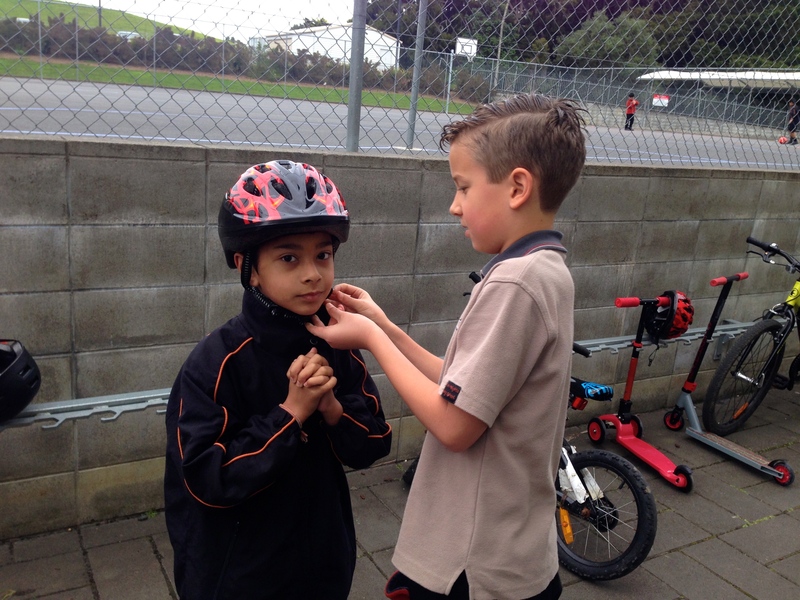 After the classroom theory session we went on the courts to learn the practical aspect of riding safely in confined spaces and changing direction. 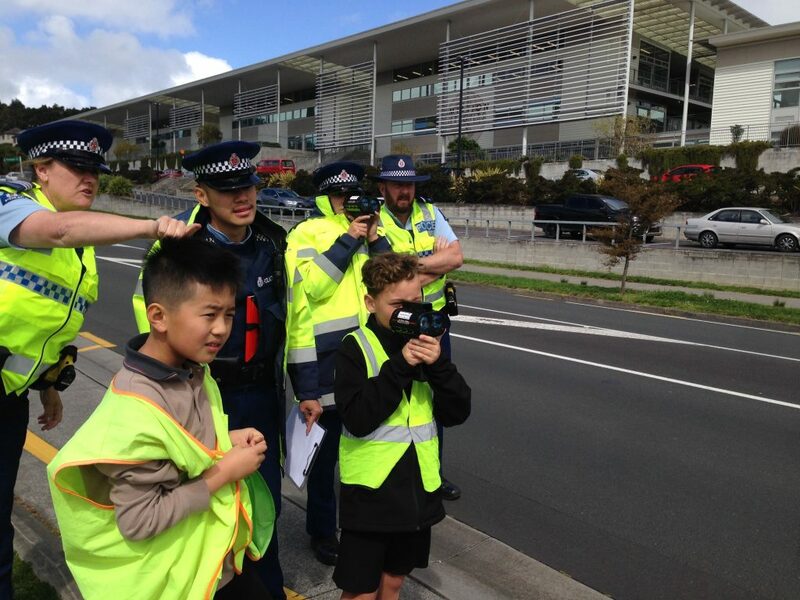 The purpose of the exercises was to remember that we share the road with pedestrians, other cyclists and vehicles. It was intense and we enjoyed learning a life skill. 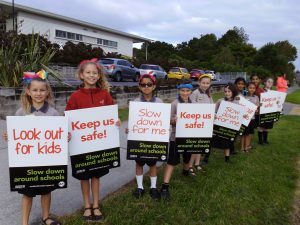 During Road Safety Week we held up our placards, rewarded parents who parked responsibly around our school and ran a poster competition. 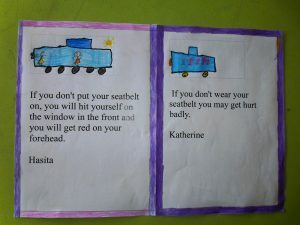 Students were encouraged to design digital posters with a focus on the importance of wearing seat belts and not texting while driving. 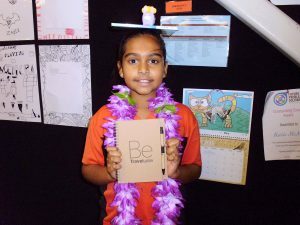 We had heaps of entries and the class that submitted the most entries was LZ 30! Congratulations! 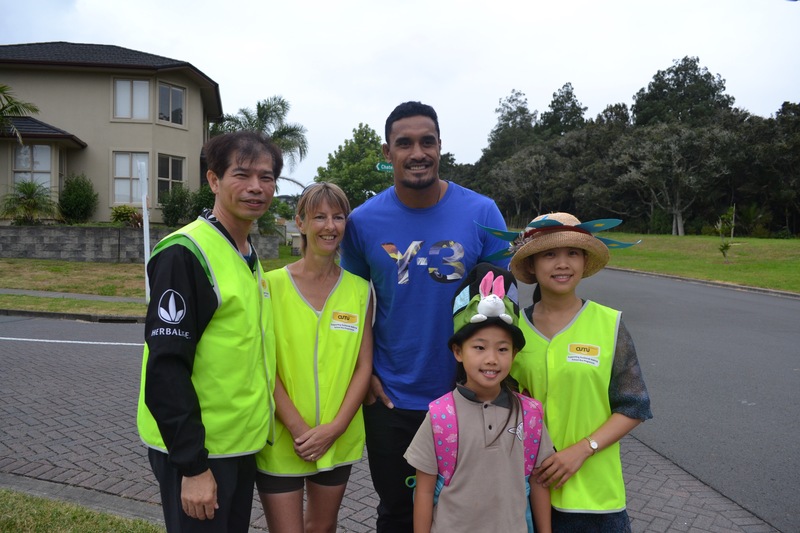 We kicked off Walking School Bus Week by holding up our placards wearing our Be Bright Be Seen accessories. Almost every student was on board with our theme and it was a huge success. 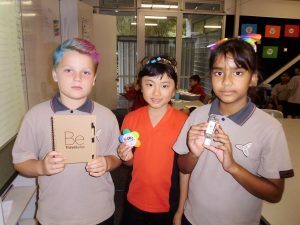 We awarded prizes to the brightest dressed in each Learning Zone. 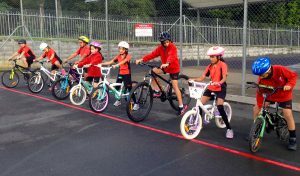 We also rewarded students who walked with the Walking School Bus and every child who rode their bikes or scooters on the day. Our staff supported the initiative as well by wearing eye popping colours. 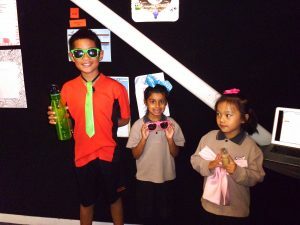 We awarded prizes to the brightest dressed child in each learning zone. 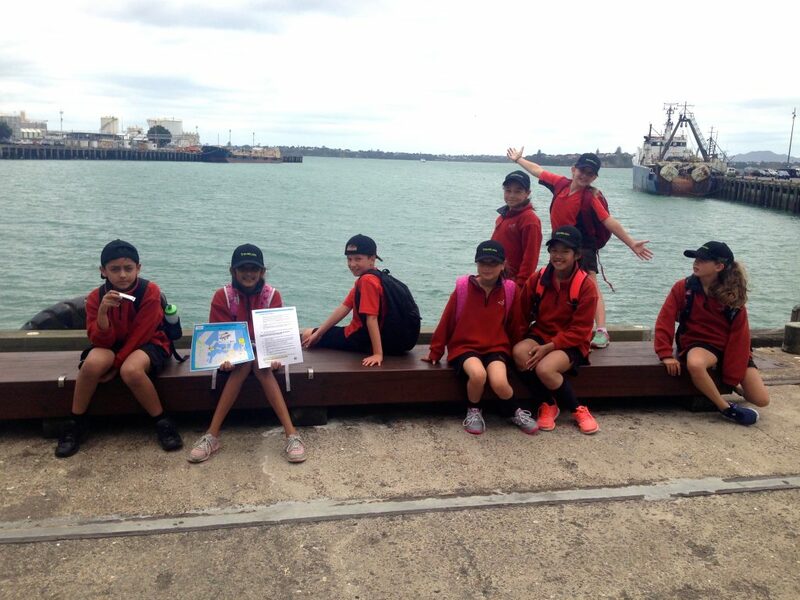 Thank you Auckland Transport for the cool prizes. We played the fun pedestrian game and won seriously cool prizes. Here is one happy prize winner. 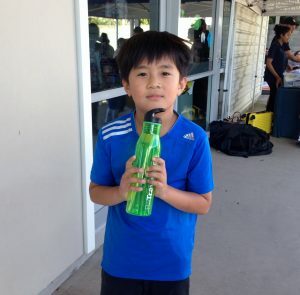 He won a drink bottle which came in handy immediately. 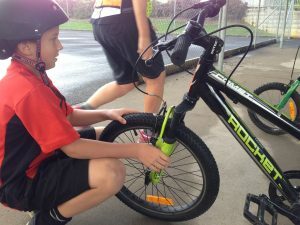 This year biking to school seems to be the preferred mode of transport. 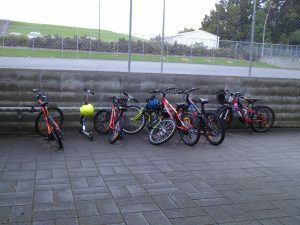 This is what our bike stands looked like despite all the crazy weather at the start of this term! 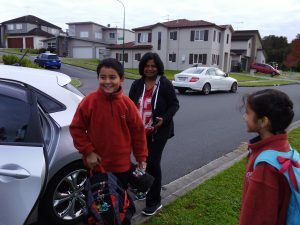 We have just one Walking School Bus this year and would love to have more routes operated by parents. If you are interested and think you have the time and commitment we would love to hear from you. 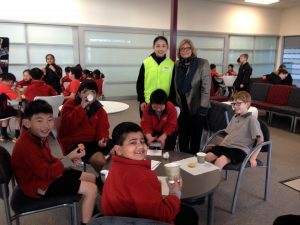 We celebrated our Walking School Bus by having a Milo and donut morning. Here are a couple of pictures from that day. 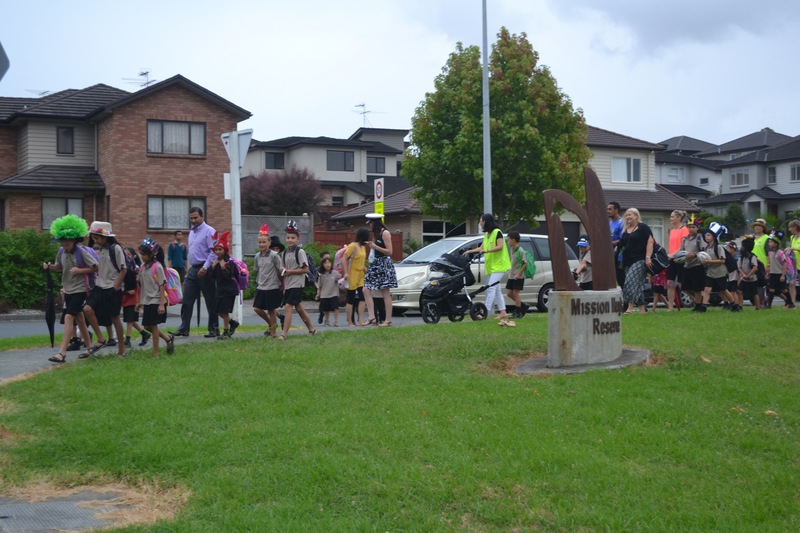 During Road Safety Week you would have seen our team around our ponds presenting lollies to parents who parked responsibly around our school. 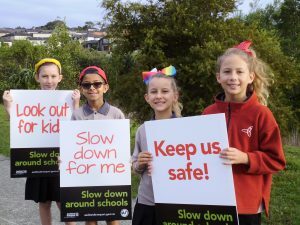 The team returning after a hectic morning of handing out lollies and holding up signs to remind our community to Slow Down. Our bay is manned by staff at drop off and pick up times. 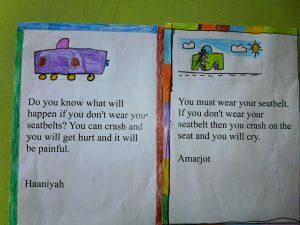 Our community is aware of the need for booster seats. 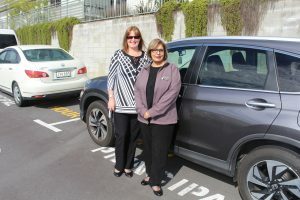 Leading by example is our principal Mrs Vohra who carpools every day with one of our admin staff. 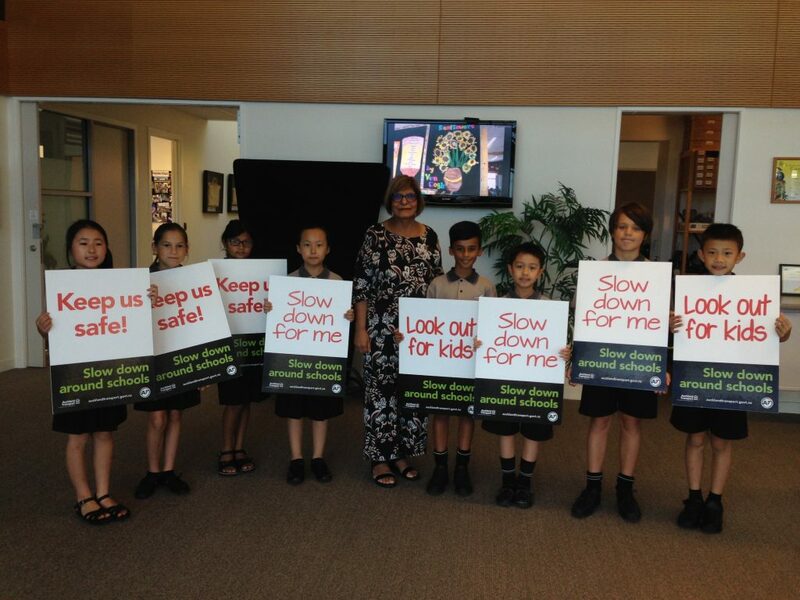 Our school van arrived just in time for Road Safety Week. We use it to transport teams to their various events. It made a significant reduction to our carbon footprint. In fact quite a few of our staff carpool as well. 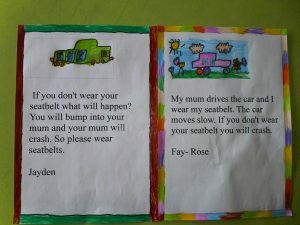 Our Year 1 students wrote about what safety meant to them. Have a look at what they had to say. 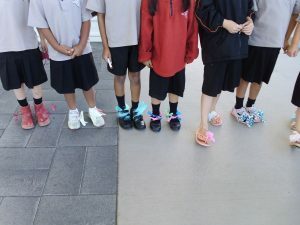 To maximise the visual impact of Walking School Bus Week our students wore Funky Footwear. 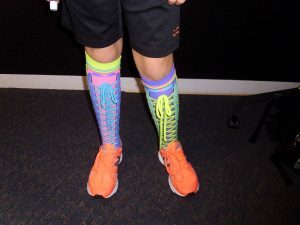 Here are some of the creative ideas our students came up with for Funky Feet. 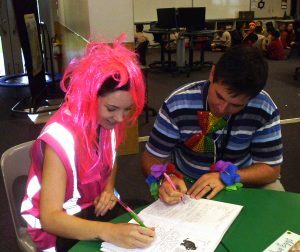 Our teachers got into the act as well! 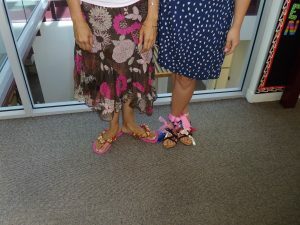 She stuck as many pom poms as she could onto her shoes. Cute! 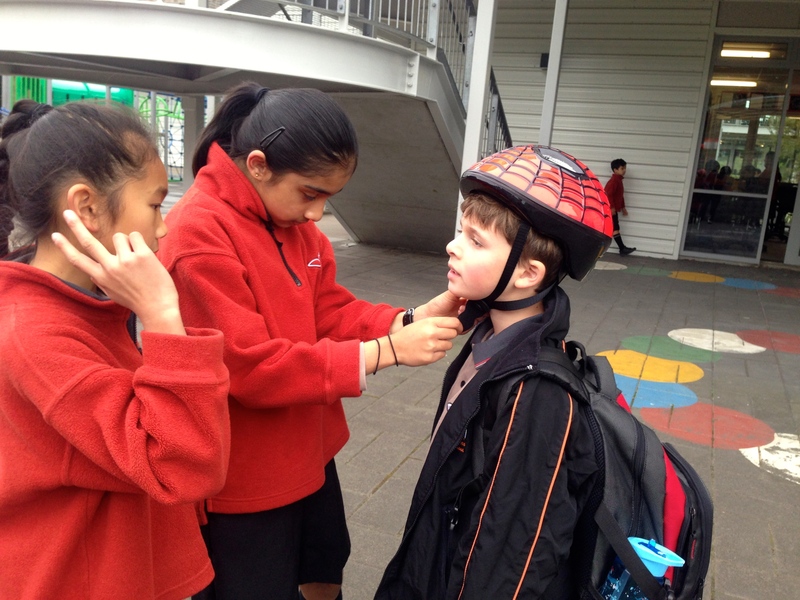 Safety at the School Gate is a partnership programme run with Auckland Transport. 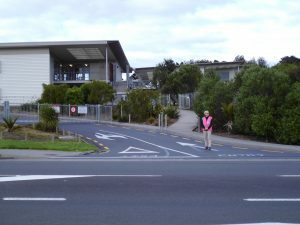 The aim is to improve safety around the school gate for students who are put at risk by drivers who park illegally. Please be aware that parking officers will be on patrol and you must park safely. They will not be issuing warnings and will be ticketing drivers who are illegally parked. Thank you parents for your commitment to keeping our students safe. 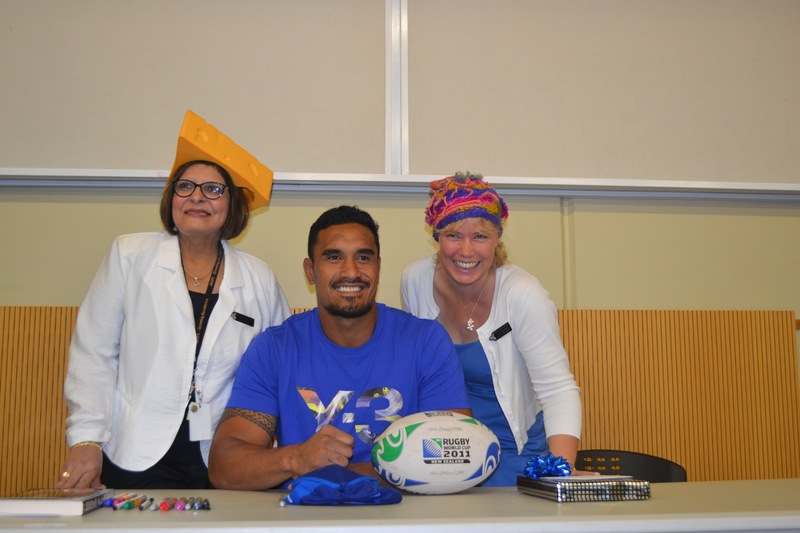 We entered a writing competition and won a visit from Jerome Kaino. He walked with the Walking School Bus during Walking School Bus Week. 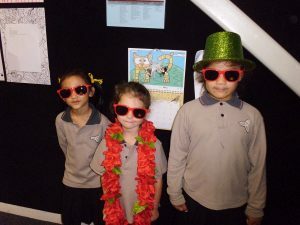 It was Hilarious Hats day as well. We must have made a strange sight that day, Jerome in the midst of a sea of hats! Jerome with some of our parent walkers. 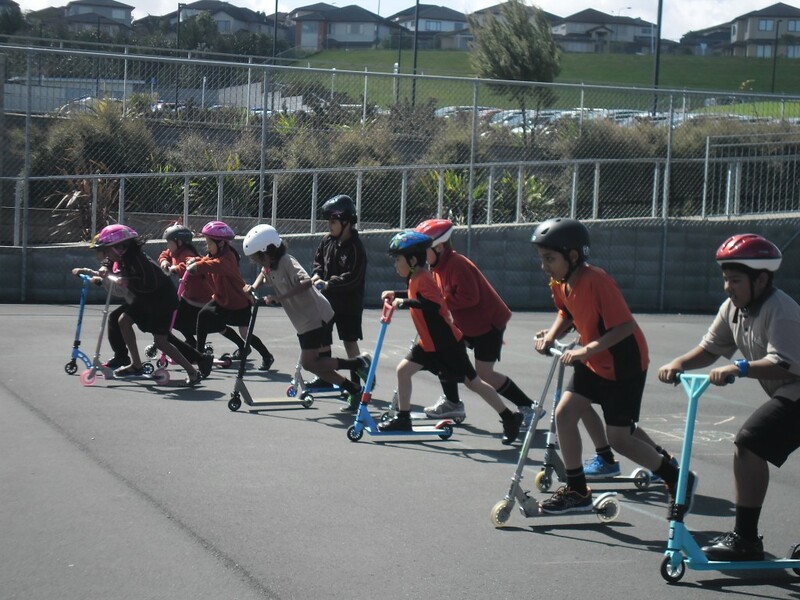 Auckland Transport arranged scooter training for us. 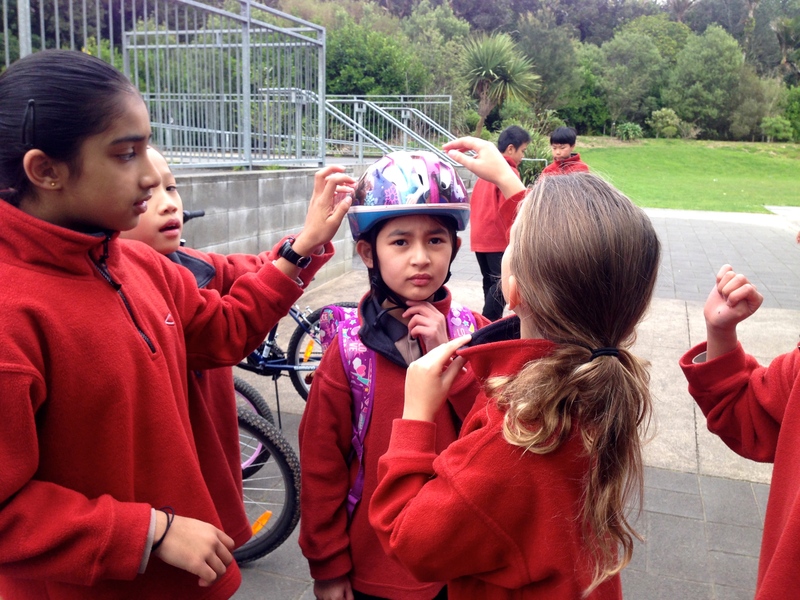 They demonstrated the correct use of helmets, made us aware of potential hazards en route to school and instilled sound safety practices. 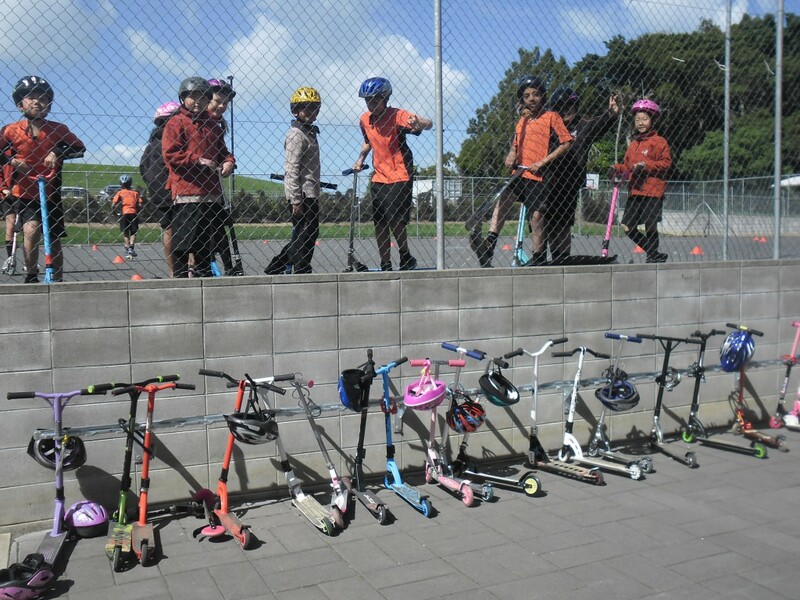 We have scooter racks at school and students are welcome to scooter to school and use their own locks to secure their scooters. 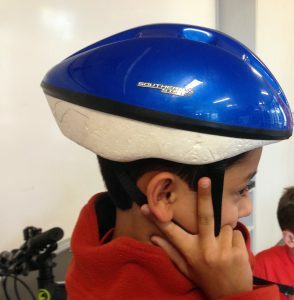 Students must wear helmets – these are to be worn with the pointed end at the back, two fingers above the brow, one finger between chin and chin strap and straps around the ears in a V. They need to be alert for sneaky driveways and wheel their scooters across roads and crossings. 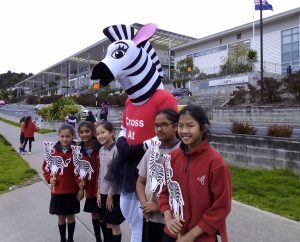 Please use the school crossings when crossing Jeffs Road and Valderama Drive. 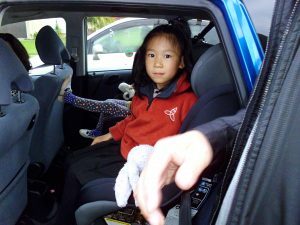 Parents please remember to drop your speed to below 40km during drop off and pick up times. 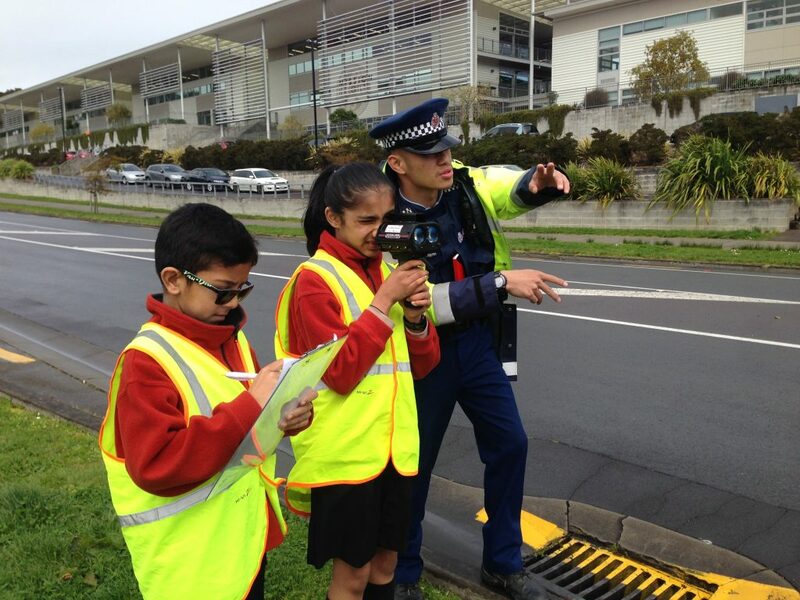 Please note the road patrollers on Jeffs Road are on patrol from 8:00am till 8:30am. Then again from 3:00pm till 3:20pm. 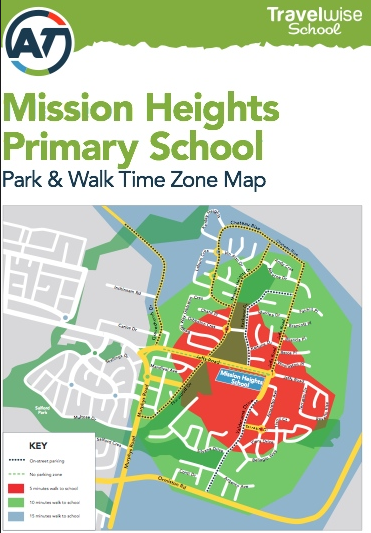 Mission Heights Walking School Bus Map January 2018. Please click on the link below for the map and contact details of our wonderful parent helper. We have one Walking School bus that starts at Beros Pl. This map provides a bird’s eye view of parking spaces around our school at drop off and pick up times. The spaces are marked by the black dots. 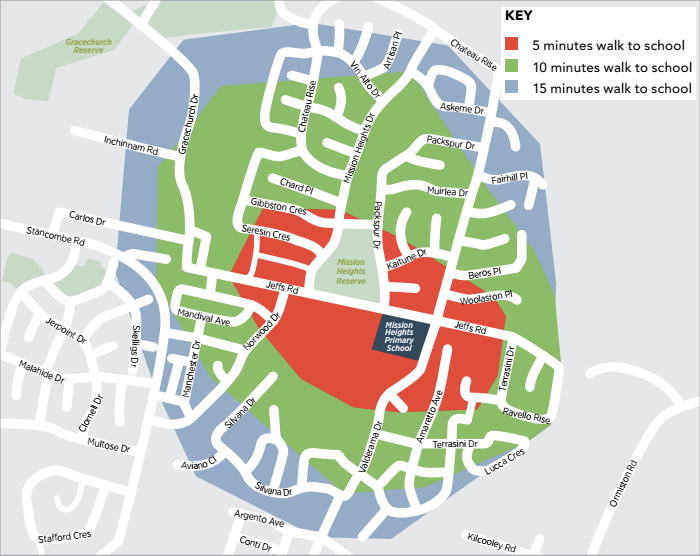 The map below gives you an idea of how long it takes to walk to school from various points in our community. The red zone takes 5 minutes, the green takes 10 minutes and the blue zone takes 15 minutes. Our students actually walked these distances and timed themselves to provide you with this map. We are a Green Gold Enviroschool! We take this accolade very seriously and continue to look into ways to demonstrate we care for our people, programmes, practices and places. 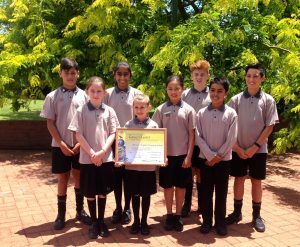 Here we are with the certificate that we were presented at the Enviroschools awards. 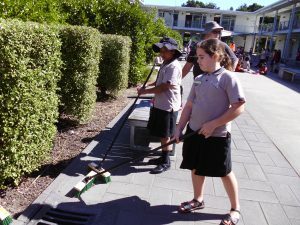 It is Auckland Council’s vision to be pest free by the year 2050. 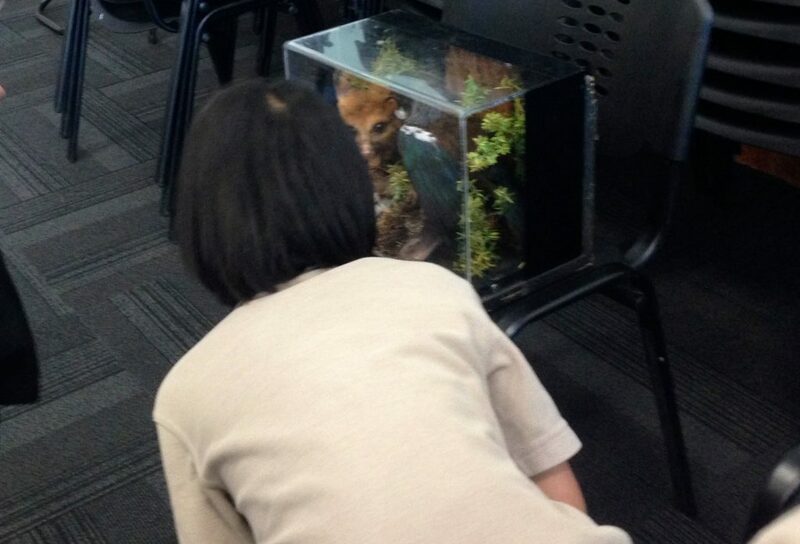 A team of students from the Junior College shared their Pestival learning with us. As part of our Flatbush Cluster initiative we cleaned up the Tane Forest with the MHJC student team. 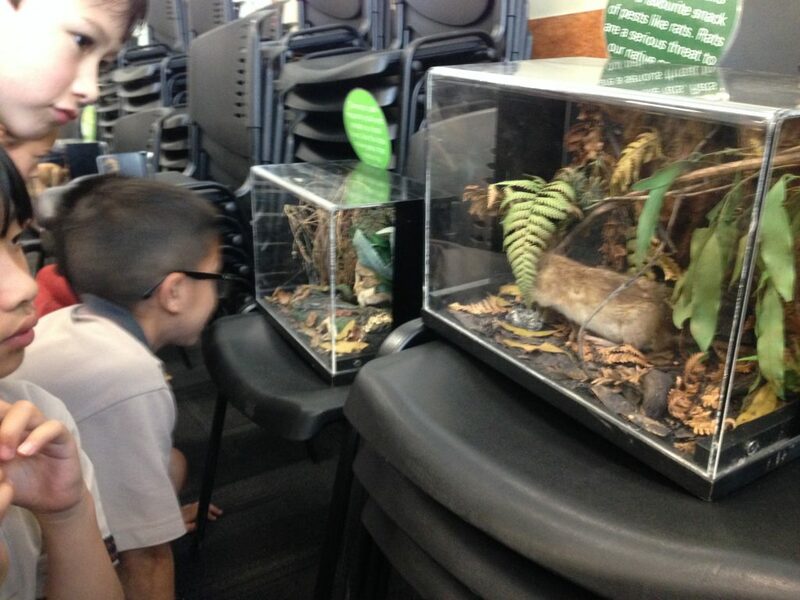 At Mission Heights Primary we pride ourselves on our environment! Being a digital school means we’re big on conserving paper. 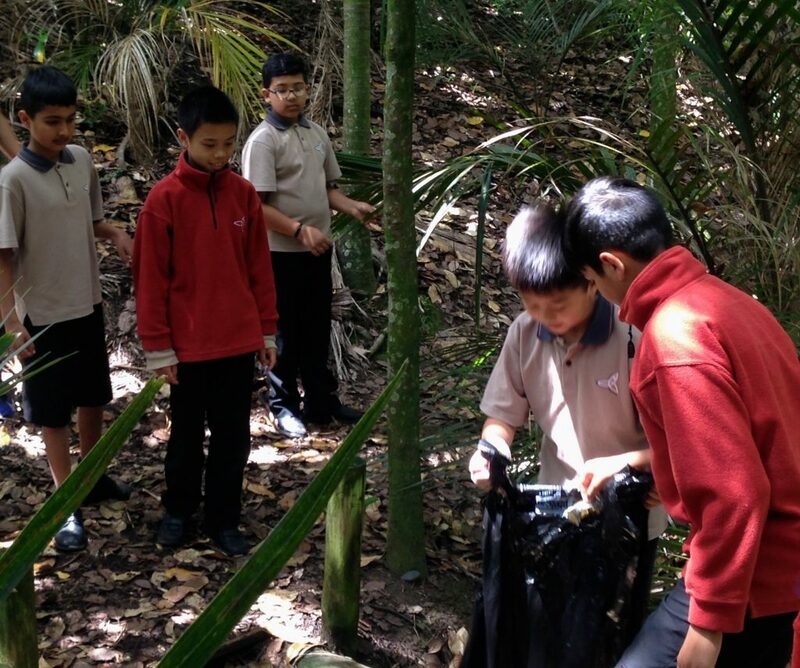 Our school has many environmentally friendly features that include recycling procedures and rain water tanks. Our lights and most of our taps turn off automatically. We switched from paper towels to hand driers as well. We have a well established orchard now and our students enjoy feeding and tending to it. We do our bit for the dwindling Monarch population by having a healthy and well looked after Butterfly Garden. Our portable worm farm takes care of our fruit scraps. Solar panels and our special window glass ensure optimum energy efficiency. 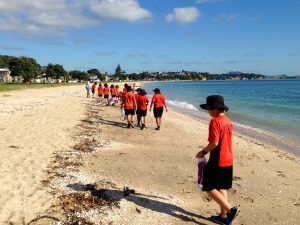 We are committed to caring for the environment beyond our school gate and went to Eastern Beach to do a beach clean up. Here we are sifting through sand looking for the enemy – plastic! We collected so many objects that could hurt our marine life. It was the last of those splendid summer days. 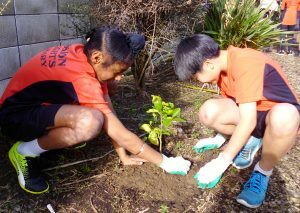 Here we are planting and feeding our fruit trees. 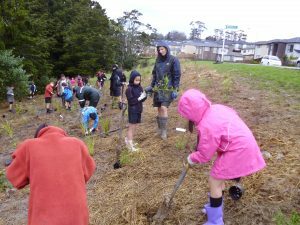 It is so exciting that we are a part of the Howick Fruit Trees at Schools Project. Students get to observe the progression from seed, to tree, to flower, to fruit and back to seed again. 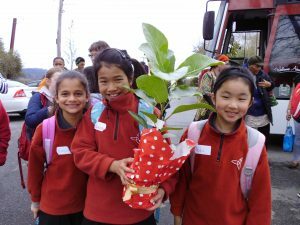 Three of us went on the Great Enviroschools Bus Tour. 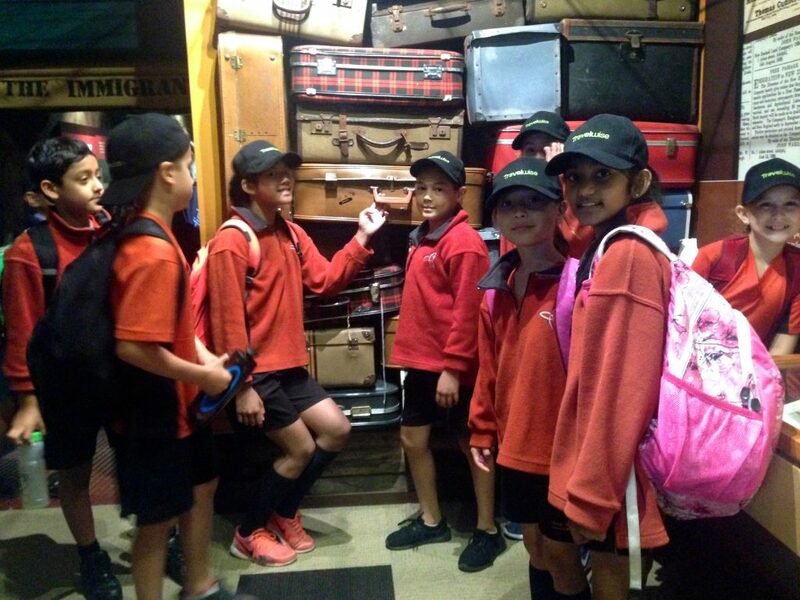 We visited Te Ngira Marae, Pukekiwiriki Pa, the Papakura Art Gallery and Drury School. We had the most amazing and varied experience. 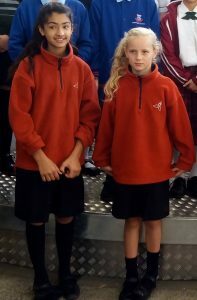 Two of our team members attended the launch of the Howick Fruit Trees at School Project which was sponsored by Kings Plant Barn. They gifted us 18 fruit trees and the stakes and compost too! 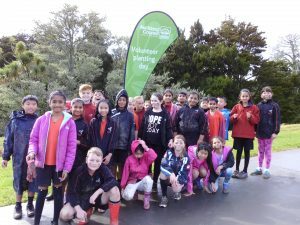 Thank you Auckland Council for inviting us to join in this wonderful initiative which is going to be a most valuable learning experience. 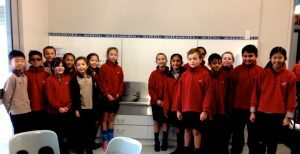 We did restorative planting with Auckland Council. 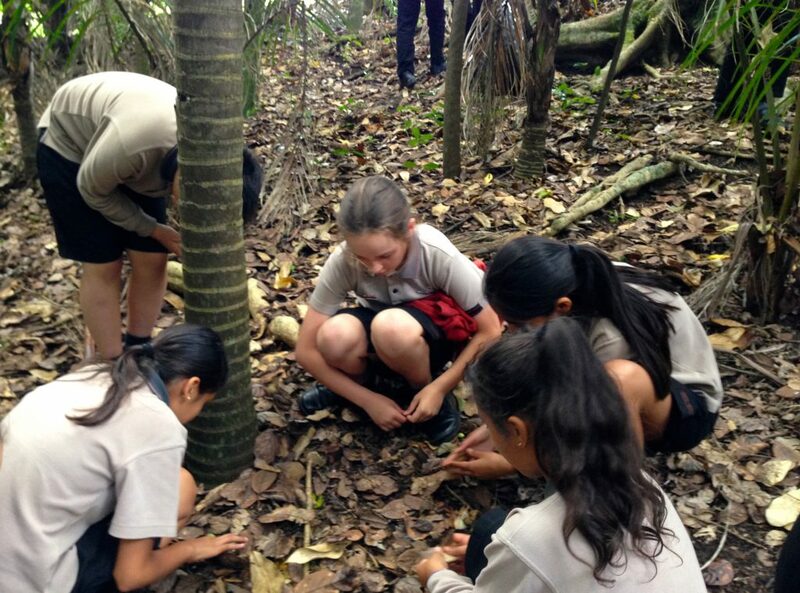 Our team recognised that planting prevents erosion, creates a sustainable habitat for our indigenous birds and insects. And of course most importantly that trees provide us with clean air. Look at this beehive of activity! Right, we dig a hole twice the size of the root ball, drop the fertilizer pellet in the hole, gently ease in the plant, and pat the soil back in and around the plant. There – sorted! 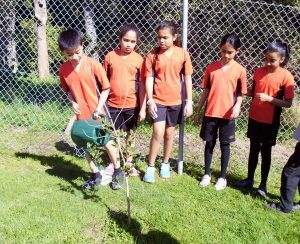 We are signed up with paper4trees and earned 15 indigenous trees which arrived in Term 2. 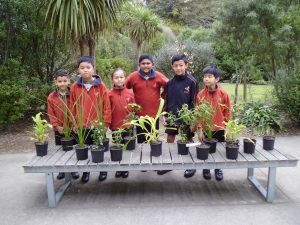 Mrs Devanath’s Garden Club planted them. Here are some of her team on the day of the planting. We have adopted a park this year and we’re quite excited about it. 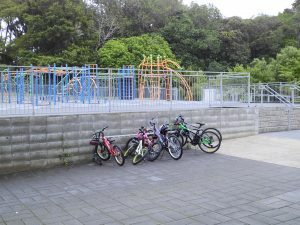 Preliminary meetings were held and we have already been out to the Mission Heights Reserve and tidied up. 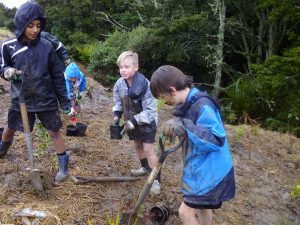 We look forward to working with Wai Care as well to care for our streams. Here is a photo of us on a litter ramble. 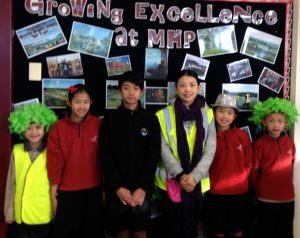 In Term 3 we will be doing some Restorative Planting alongside Auckland Council. 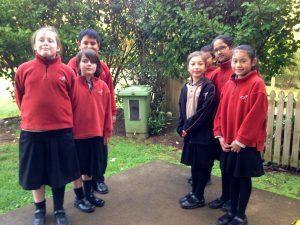 We look forward to being involved with the environment beyond our school gate. Here we are helping Mr Revell with keeping our own grounds tidy by brushing the bark into the hedge area. 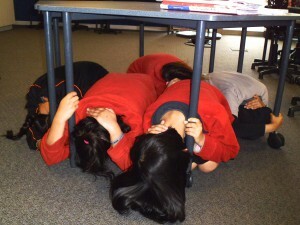 We joined the nation in the Earthquake Drill. 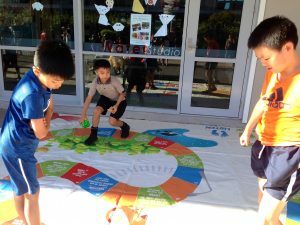 Every learning zone was made aware of how best to react in an earthquake through a variety of resources and media. Here is a picture of us demonstrating Drop Cover Hold. 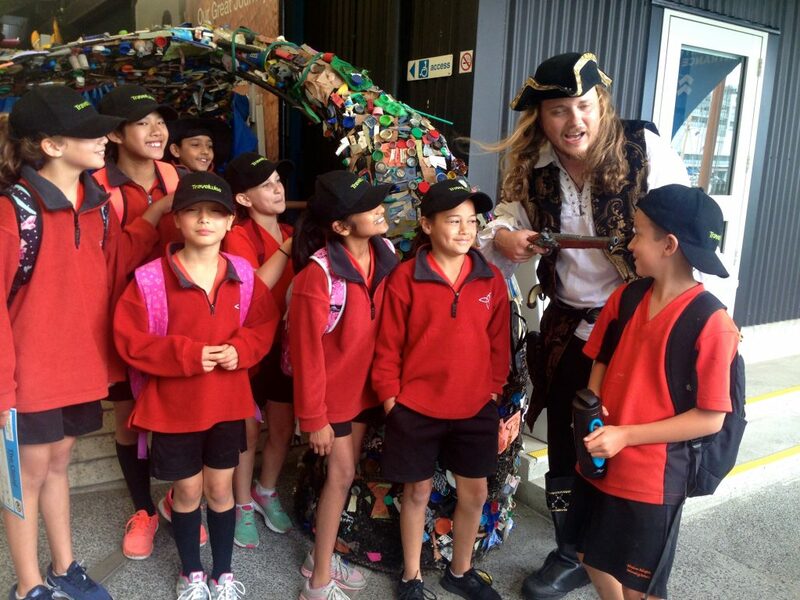 Because we are a rubbish free school, we encourage our students to bring in wrapper free morning teas and lunches. This is what we have in mind when we say wrapper free. It means no cling film or foil or chip and muesli wrappers that simply end up in landfill. 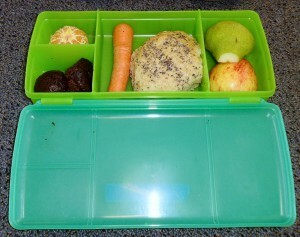 Take a look at an ideal lunch box. It is wrapper free and illustrates healthy choices too! 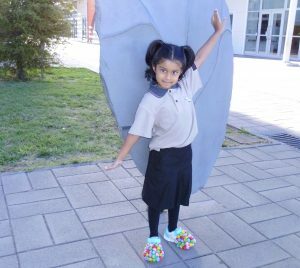 Each learning zone ensures that their shared spaces are neat and tidy at the end of the day. 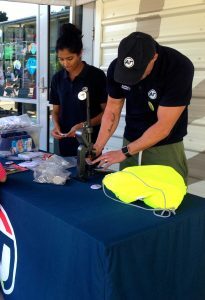 The Team are issued with Enviro Councillor and Monitor Badges and are responsible for decision making and collecting used paper for recycling. They are responsible for all three primary blocks, the administrative block, and the library. 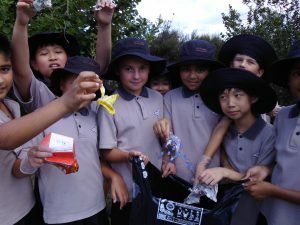 The Enviro Council rewards the Enviro effort across the school. 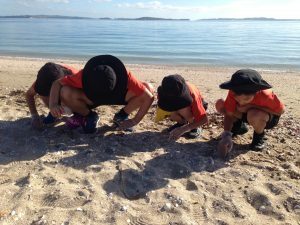 They look for tidy bench tops and cubby holes, zero litter on floors, bag cupboards that are kept shut, tidy maths and reading stations and publishing that is neatly displayed. 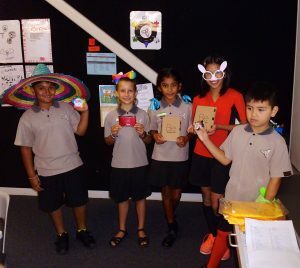 The individual Learning Zone or Studio that demonstrates the greatest effort is presented with the Enviro trophy which they get to keep for a fortnight. Mrs Vohra is always happy with the number of students that gather around the Butterfly Garden and want to show her the Monarch at various stages of it’s metamorphosis. From a pin head size egg to a caterpillar, chrysalis and a butterfly. 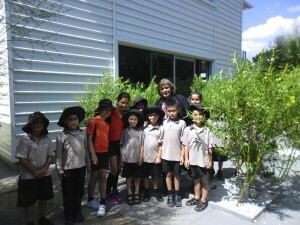 Our butterfly garden is a favourite spot for students and families before and after school. 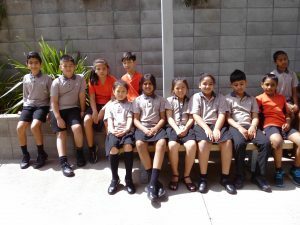 It was the legacy of the School Council 2012. They left the ongoing upkeep of it in the good hands of the Enviro Council. 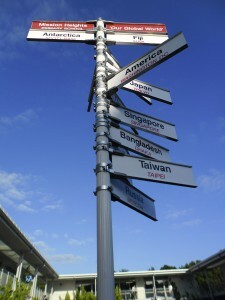 The MHP Global Sign Post is a celebration of our diverse cultures. 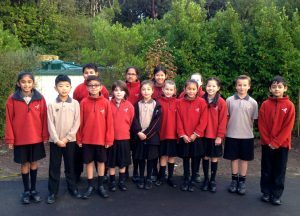 It is the legacy of the School Council of 2013. And here’s the legacy of the school council of 2014. It already looks great and we are very excited about it. 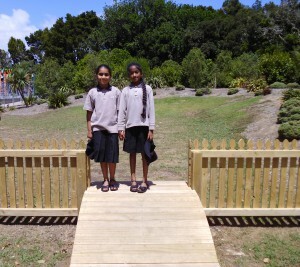 We have these neat little bridges with a board walk that just so perfectly frames our Butterfly Garden. 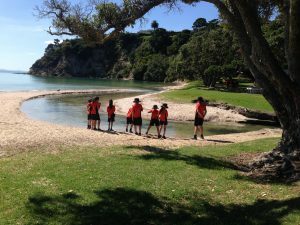 It’s a favourite spot for students during break times. But wait – there’s more… the hand prints of our foundation students and staff have been immortalised in our logo. 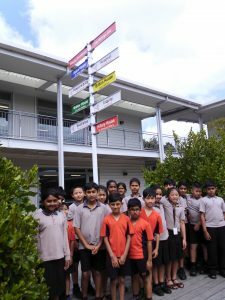 Check out our school values and house heroes signpost. The wonder of fruit trees right here on our doorstep. 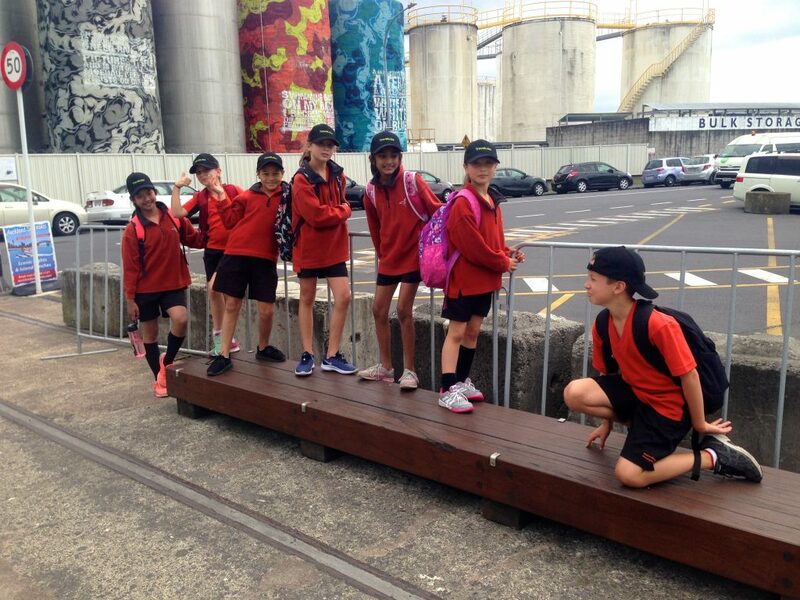 Just chilling on our Friendship Benches – yet another legacy project of our outgoing Student Council. We are signed up with Paper4trees to earn trees for our recycling effort. They even provide us with our grey bins made of recycled light-proof milk bottles. We earned 14 indigenous trees for the year 2016. 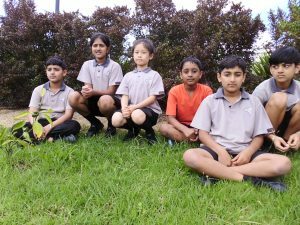 These were put into the ground by Mrs Devanath’s Garden Club. 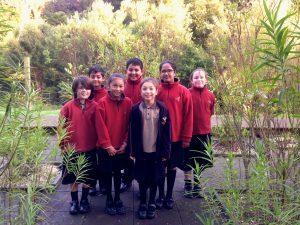 We chose trees that encourage indigenous birds and insects to make our school their home. The effort we put into our gardens always gives us a good feeling. 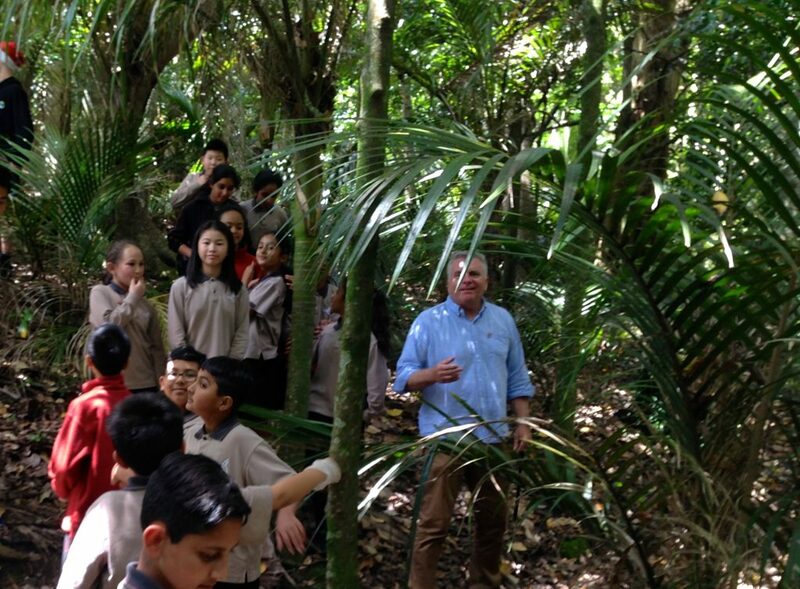 Mrs Devanath is taking her students to the Botanical Gardens for the Eye On Nature workshop. 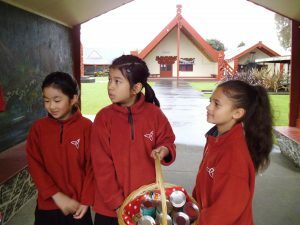 It is a great opportunity for our students to learn life skills. We continue to have a busy time with worthwhile, authentic projects!